The latest rival on DavidNews.com monitor is a project called BetCash. It joined our Pinned Golden Stage position 1 seven days ago, which guarantees the first position on our monitor. This HYIP has been online for almost three weeks. This program is different from others recently reviewed on DavidNews.com in terms of available payment options! Lately, we have seen many Bitcoin only projects, however, BetCash accepts four most common payment options - Perfect Money, Bitcoin, Payeer, AdvCash. I have reinvested in this program $400 and will inform you about the performance of it in the following days and weeks on our monitor. Keep reading to find out more information about BetCash! 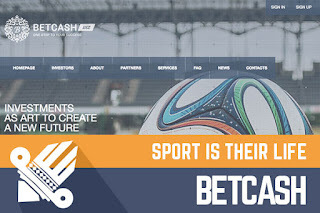 As I open the home page of the BetCash website the first thing I see is a large photograph of a football and blurred image of a stadium in the background. Of course, I didn’t expect anything else except sport related photography on the main background. What exactly is BetCash and how they are going to earn money to pay interest on deposits? BetCash is positioning itself as an international investment business company founded as the fund for the assistance and development of online betting and trust management by using software and hardware on the Internet. If you like reading check out the website and read the full legend. According to the information on the website BetCash was launched on the 1st of May, but from forums, I found out that the real action began a month ago – at the end of May. Most likely BetCash website has a unique design. At least, I haven’t seen something similar. The layout of the content is very common for HYIP’s. The good thing is that the most important information such as facts about invested amount and investors is placed on the homepage and I’m not supposed to do much scrolling to find it. Moreover, on the homepage, you can as well find the current daily interest rate, which is changing from day to day. I will write more about it in the following paragraph about the interest rates. Unfortunately, I couldn’t find the calculator on the home page to calculate potential profit. Therefore, you must do it yourself. Visitors using mobile devices have access to a limited number of pages – homepage, sign in and sign up page. However, all most important information is out there. In the meanwhile, I noticed responsivity bug with two elements on the home page – daily interest chart and affiliate program table is wider than page width on the mobile version and only a part of it can be seen. However, desktop users will not have such issue. BetCash has only one investment plan, which most likely is easier for many potential investors! It has a floating daily rate 0.5-1.5% for 300 days. The current rate is 0.75%. Minimum deposit is $50 and minimum withdraw is $0.20. Initial deposit is included in the payments. For example, $200 investment would make $1.5 a day and would reach the break-even point after 134 days. Therefore, the deposit would start making a profit only after that. Moreover, the brake-even point will be set back if you choose daily withdrawal (5% fee – explained in the next paragraph). Of course, if the average daily rate will increase, break-even point will be reached sooner. However, from the information on the chart, I understand that it might drop even lower and take more time. BetCash offers two different options to withdraw the money! First, withdraw once a month without any extra charges. Second, automatic daily withdraws, but in this case, you will be charged 5%. Withdraw option can be selected after making the deposit on the dashboard for registered users. I would like to provide a short introduction in the personal dashboard for registered users. It looks pretty much a standard dashboard with the main information blocks like balance, last deposit, and profit. Moreover, daily interest rate chart can be found here and it’s not necessary to check the homepage every time. From the previous paragraph, you already learned that there are two withdraw options. In case you select the daily withdrawals to remember to add wallet numbers on “Payments Data” tab on the dashboard settings. Otherwise, daily withdrawal function will not work. Of course, there is also information about affiliate program where you can get a unique link for partner program and banners for integration on the website. No matter if BetCash project admins call it a fund or a betting platform, we see here a long-term project with comparably low-interest rates. Of course, such interest rates are more realistic and can be easier fulfilled by project owners. Moreover, the deposit is already included in the interest rate. Even though there is a lack of calculator on the website and a few mobile bugs, overall the website looks fine and promising. Do your own calculations depending on the deposit and chosen one of the withdraw options to understand your real benefits. Now I’m looking at a comparable new program with low floating rate and it’s hard to predict, which direction the HYIP will float and if there is a potential to make a profit. Therefore, if you ever decide to make any investments, don’t invest more than you can afford to lose! Investment plans: Variable daily return from 0.5% up to 1.5% for 300 days, initial deposit included in the payments. Withdrawal at last two days of every month or auto payment daily with 5% fee.